Just recently, scientists have developed a reconfigurable quantum photonic chip that can lead to the development of the quantum computer. 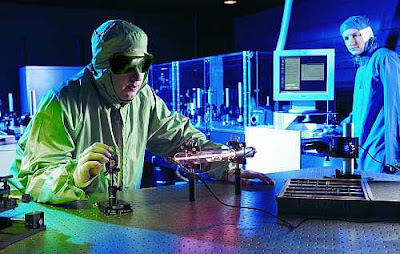 In the medical field, photonics (bio-medical optics or biophotonics) is used in the correction of poor eyesight, laser surgery, surgical endoscopy, and even tattoo removal. Photodynamic Therapy (PDT) is a form of photonics that is used to treat cancer. Other advanced applications for this technology involves facial plastic surgery, vascular birthmarks and malformations, breast cancer and treatment for a wide range of skin conditions, including acne, rosacea, psoriasis, birthmarks and skin cancers. Imaging is also an important component of photonics. It can reconstruct an internal anomaly inside an organ or tissue by studying the light collected. The procedure involves scanning a sample with a light source while collecting light that exits the boundaries. The collected light is then matched with a model to find out the differences in light data. Photonics is an ideal medium for treatment since light is non-invasive and non toxic. The limiting factor of photonics is that the light used for treatment cannot penetrate deeply. Current technology has light wavelengths usually reaching to about 1cm deep into the tissue. To achieve greater light penetration, hollow needles are used to get light into deeper tissues. Another way is using new high powered LED technology. The Beckman Laser Institute & Medical Clinic (BLI) at the University of California, Irvine (UCI), is one of the first dedicated center for research and treatment using lasers and light. The institute was founded in 1986 by Michael Berns and Arnold O. Beckman, to use lasers to study the basic biology of cells, and to apply the knowledge gained from those studies to understanding, diagnosing and treating disease. BLI technologies and discoveries have had a major impact on cutaneous disease and treatment, cellular micromanipulation, intraluminal endoscopic imaging, functional imaging of cells and thick tissues, targeted phototherapies, and multi-modality imaging.